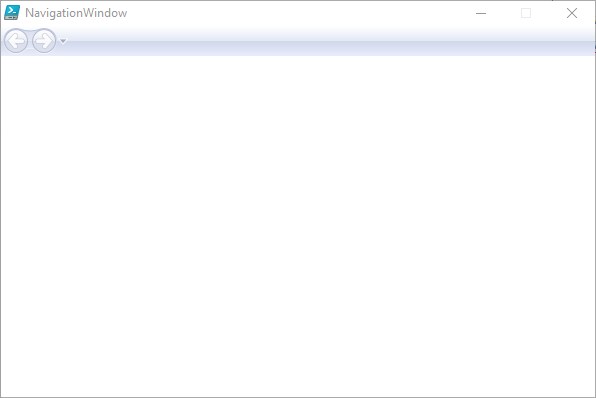 In WPF, there are two types of window which can host your application content. The most commonly used is simply the window (System.Windows.Window in .Net). But there is another window type, the navigation window (System.Windows.Navigation.NavigationWindow) which takes a slightly different form and includes some basic navigation controls similar to what you would use in a web browser. This kind of window can be useful in certain situations such as hosting documentation or help content, or recording input over several pages, as the user can go back and forward between the content pages using the navigation history. 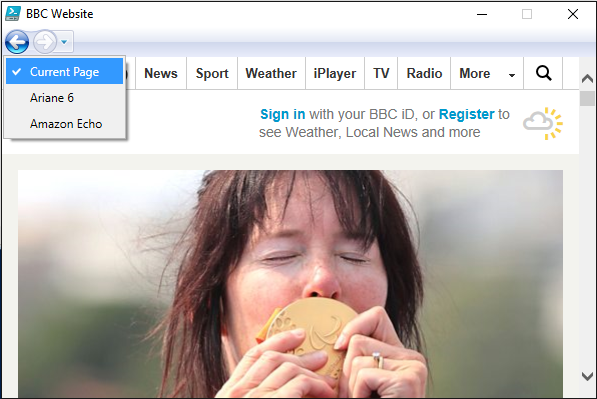 The key to making the navigation window work is to use a page control (System.Windows.Control.Page) to host your content. Like the window, a page can only contain a single child control, so you need to use a layout control like a grid to contain other window elements, such as textboxes and buttons etc. You can then simply call the relevant page when you navigate. Below is a simple example of a navigation window which has two actual pages, and the third “page” is a website. The window itself and the pages are defined in XAML, stored to a hash table, then called by simply setting the Content property of the navigation window. In the case of the web page, we use the navigation service to load the page. You’ll notice that after you leave the first page the navigation history is enabled and you can go back to the previous pages. 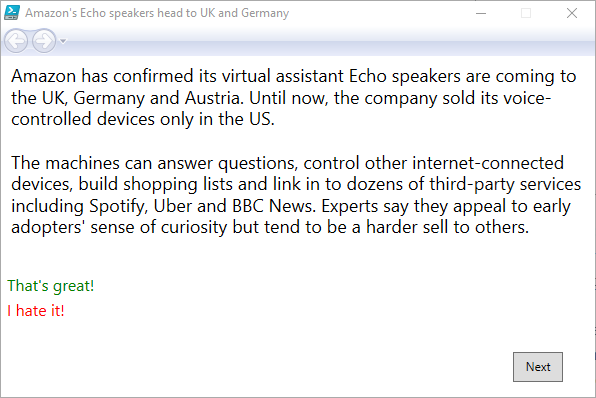 Amazon has confirmed its virtual assistant Echo speakers are coming to the UK, Germany and Austria. The machines can answer questions, control other internet-connected devices, build shopping lists and link in to dozens of third-party services including Spotify, Uber and BBC News. Experts say they appeal to early adopters' sense of curiosity but tend to be a harder sell to others. 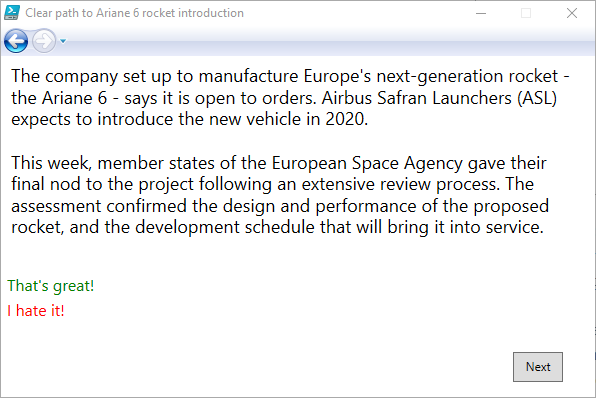 The company set up to manufacture Europe's next-generation rocket - the Ariane 6 - says it is open to orders. Airbus Safran Launchers (ASL) expects to introduce the new vehicle in 2020. This week, member states of the European Space Agency gave their final nod to the project following an extensive review process. The assessment confirmed the design and performance of the proposed rocket, and the development schedule that will bring it into service. $Hash.NavWindow.Title = "Clear path to Ariane 6 rocket introduction"
$Hash.NavWindow.Title = "Amazon's Echo speakers head to UK and Germany"
In order to maintain a healthy ConfigMgr environment, it is important to know that your clients have successfully run the Configuration Manager Health Evaluation task and reported the results to the Site server. Sometimes you will find a number of systems that have not reported any health status to the Site server. In the Devices node of the ConfigMgr Console, you will find “No Results” for the Client Check Result, and the Client Check Detail tab displays nothing, even though the system may be active. In most cases where the evaluation status reports “Unknown” by this query, you will find that the client has actually run the health evaluation task, it just hasn’t reported the results to the management point for some reason. 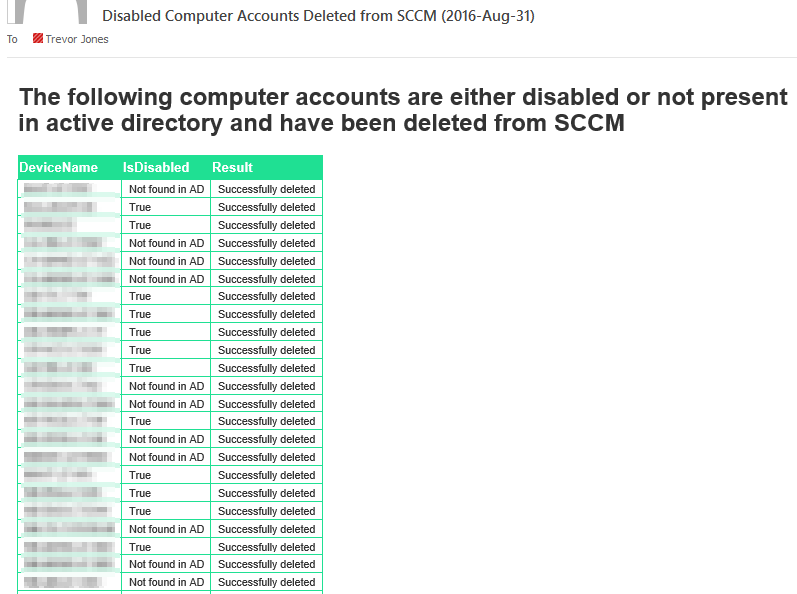 I published a PowerShell script previously that lets you view the current health evaluation status on any remote computer by reading the CCMEvalReport.xml file – you can find the script here. For these “Unknown” status systems, however, I want to force the client to send a health evaluation report to its management point, so I prepared the following PowerShell script to do that. It can run either against the local computer, or a remote computer. Admin rights are required on the target system, and if running against the local computer the script must be run as administrator. The script simply sets the SendAlways flag for CCMEval reports in the registry to “TRUE”, triggers the CM Health Evaluation task to run, waits for it to finish, then changes the SendAlways flag back to “FALSE”. When the CCMEval program runs with the SendAlways flag set, it will always send the report to the management point even if the client health status has not changed since the last report. Within a few minutes you should find that the status for that system has been updated in the ConfigMgr Console with the health evaluation results. Write-Warning "This cmdlet must be run as administrator against the local machine!" Write-Verbose "Enabling 'SendAlways' in registry"
Write-Verbose "Triggering CM Health Evaluation task"
Write-Verbose "Waiting for ccmeval to finish"
Write-Verbose "Disabling 'SendAlways' in registry"